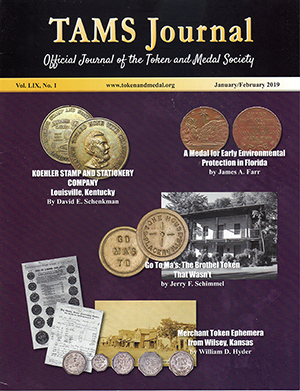 The TAMS Journal is the official publication of the Token and Medal Society. Published six times a year, this venerable magazine is as old as the organization itself; the first issue was mailed to members in April 1961. Since that time literally thousands of articles, covering a vast range of subjects, have been published. A typical TAMS Journal issue includes articles, society news, announcements relating to new token and medal issues, library updates, advertisements (every member is entitled to a free 25-word classified ad in each issue), and maverick token listings and attributions. A complete set of TAMS Journal regular and supplement issues has become a vital part of most serious collectors’ libraries. Many back issues are still available from the society for a modest fee. TAMS members may download pdf copies of selected articles using their name and password issued when they register for the TAMS Directory. See TAMS News for more information. The first fifty years of TAMS Journal are now available and searchable on the Newman Numismatic Portal (https://nnp.wustl.edu/library/publisherdetail/515304). The TAMS Journal is edited and published by Eric Schena. Please send inquiries, submissions, and advertising materials to Eric Schena at eschena (@) hotmail.com. Search the table of contents of past issues (excludes TAMS news items, reports, and press releases). Highlighted articles are available for download by TAMS members. A Subject and Author Index is being constructed as the Tables of Contents are added. These catalogs are mailed to members along with their regular TAMS Journal issues, at no additional charge.